OMEGA 4 Piece Set of Precision Protrusion Gauges for large nominal diameter Hi-Lite® fasteners in sizes 7/16'', 1/2'', 9/16'', and 5/8''. Measuring 1 5/8'' square, these OMEGA Precision Protrusion Gauges are easy to handle and provide plenty of reach to inspect larger fasteners. OMEGA Precision Protrusion Gauges are made of etched, full-hard stainless steel that insures a long gauge life. This OMEGA Protrusion Gauge Set comes on a chain for easy manipulation and storage. 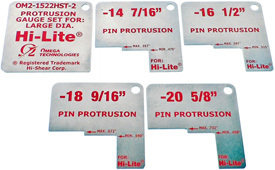 OMEGA Hi-Lok® Set of 5 protrusion gauges for nominal diameter Hi-Lok® and Hi-Tigue® fasteners, sizes: 5/32'', 3/16'', 1/4'', 5/16'', and 3/8'' Replaces Hi-Shear® 2-1522 Gauge Set. OMEGA Hi-Lok® Set of 5 protrusion gauges for nominal diameter Hi-Lok® and Hi-Tigue® fasteners, sizes: 7/16'', 1/2'', 9/16'', 5/8'', and 3/4''. OMEGA Hi-Lok® Set of 5 precision protrusion gauges for nominal diameter Hi-Lok® and Hi-Tigue® fasteners, sizes: 5/32'', 3/16'', 1/4'', 5/16'', and 3/8'' larger than the OM2-1522 gauges. 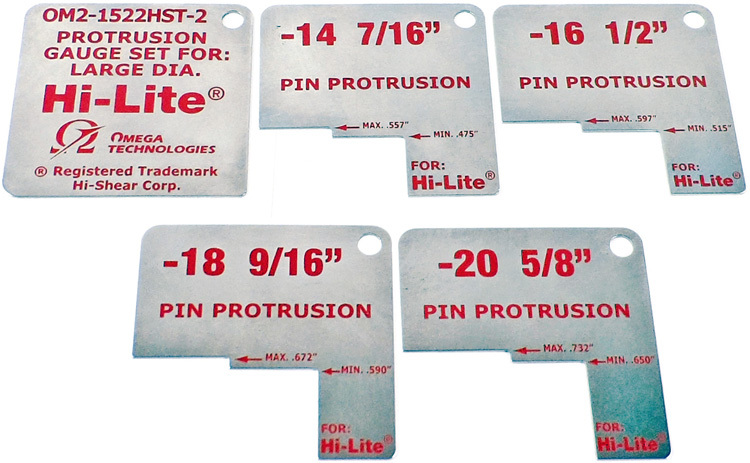 OMEGA Hi-Lok® Set of 5 protrusion gauges for nominal diameter Hi-Lite® fasteners, sizes: 5/32'', 3/16'', 1/4'', 5/16'', and 3/8'' . Replaces Hi-Shear® 2-1522HST Gauge Set. OMEGA Hi-Lok® Set of 5 precision protrusion gauges for nominal diameter Hi-Lite® fasteners, sizes: 5/32'', 3/16'', 1/4'', 5/16'', and 3/8'' larger than the OM2-1522HST gauges. The OMEGA OM2-1522HST-2 Large Diameter Hi-Lite Protrusion Gauges, 4 Piece Set is one of thousands of quality tooling products available from MRO Tools. Please browse Hi-Lok Protrusion Gauges for tools similar to the OMEGA OM2-1522HST-2 Large Diameter Hi-Lite Protrusion Gauges, 4 Piece Set. OMEGA OM2-1522HST-2 Large Diameter Hi-Lite Protrusion Gauges, 4 Piece Set description summary: OMEGA Hi-Lok® Set of 4 precision protrusion gauges for large nominal diameter Hi-Lite® fasteners, sizes: 7/16'', 1/2'', 9/16'', and 5/8''. Quantity discounts may be available for the OMEGA OM2-1522HST-2 Large Diameter Hi-Lite Protrusion Gauges, 4 Piece Set. Please contact MRO Tools for details.